Hello everyone! I hope you all survived Christmas?! We did, though I never managed to get through a whole viewing of A Christmas Story this year. What the heck? 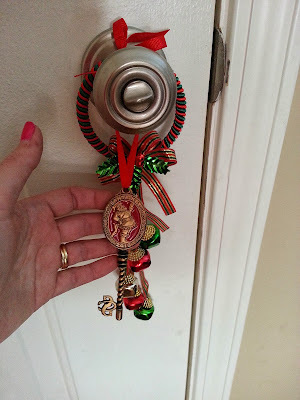 In my online perusals over the course of the season, I found a ton of lovely blog sites (such as Carmel at Our Fifth House) that participated in holiday home tours. Now certainly, my house isn't quite like those homes, but there are many little touches that make the holidays special to me. My family is best of all, of course. You saw Easy Mac and me in my Christmas post (KD refused jump in for the selfie). These here are a few of the things I love to see when I look around my own house at the holidays. 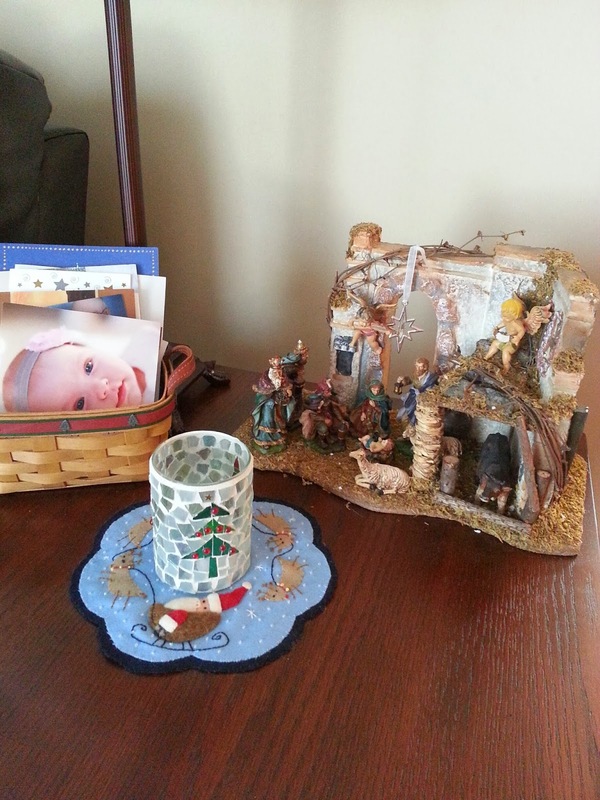 The nativity, my Santa mat (I made that and it's one of my very favorites) and my basket of Christmas cards . 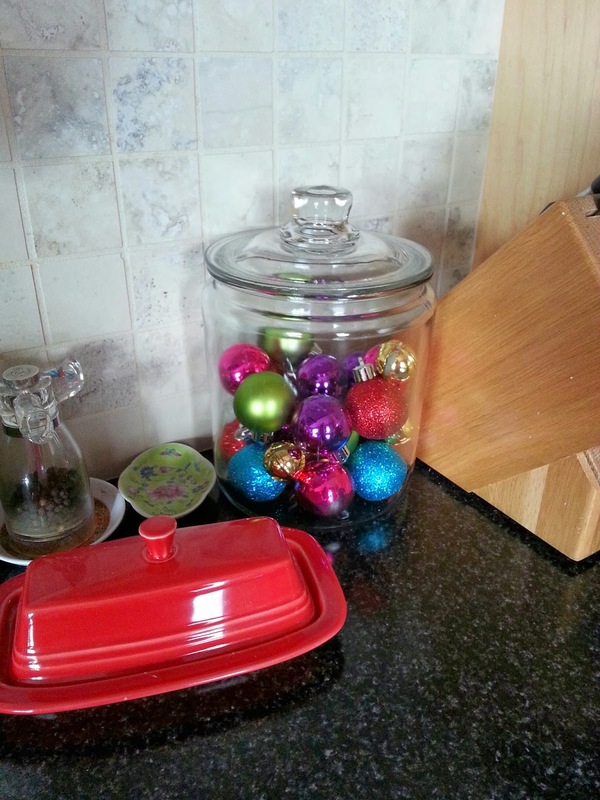 A jar of sparkly (unbreakable) ornaments in my kitchen. I thought I would just replace the ornaments with food, but I like it so much I was thinking I'd maybe just replace it with decor for different seasons now. We don't have a fireplace at this house, so Lyle had to bring the girls a Santa key so he could get in our front door. Here, it's waiting to be hung outside. 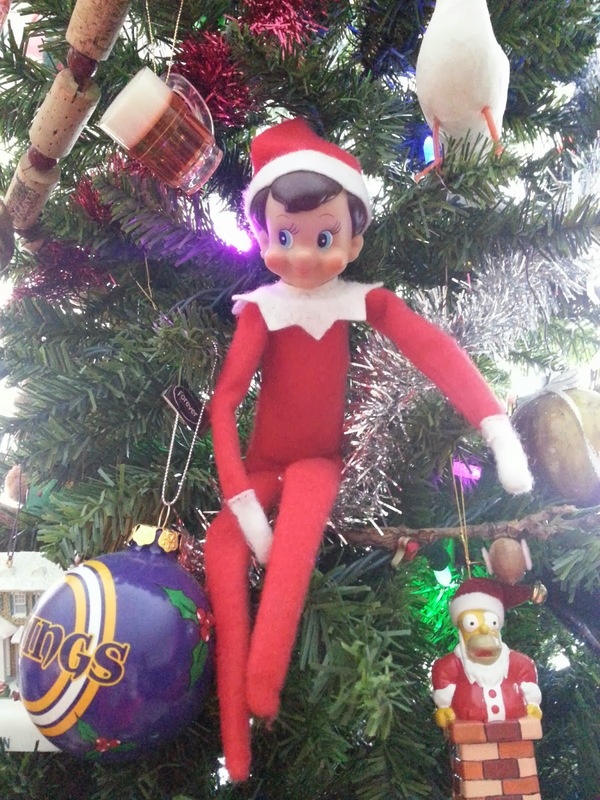 Lyle sitting on the tree Christmas Eve, for the last day of "watching". You can see he found a classy spot to sit - amongst Shaun's Homer Simpson, Vikings and beer mug ornaments (all from me). Just to the left is our Christmas Vacation house ornament. I'm gonna need a second tree just for more ornaments. I love crafty stuff. Christmas crafts may be the pinnacle of all - especially after KD told me, "Mommy, I love how you make everything" as we put up our decorations this year [she was referring to the decorations, BTW, because she was not referring to my gluten-free cooking, which has been hit or miss on their palates]. Melt my heart! 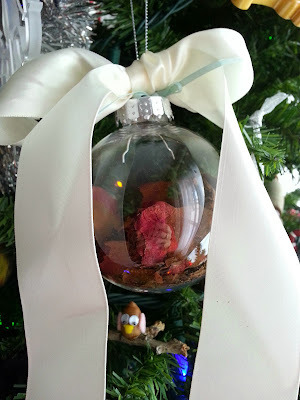 I made this ornament this year out of rosebuds and petals from my wedding bouquet, which didn't survive our last move very well. I figured if I didn't preserve it in something like this soon, it may well disintegrate. The little blue ribbon held my pearls at the right length on my wedding day (and was something blue) and the ivory ribbon was saved from wedding gifts. Shaun says the roses look like cigar butts. SO ROMANTIC! Ratty or not, it's one of my favorites. 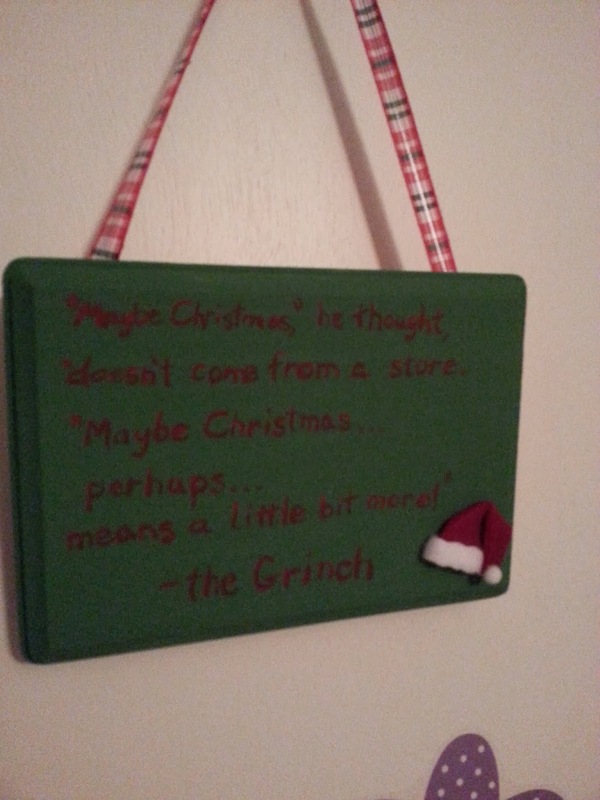 I love the Grinch quote here. My hand-painting isn't that artistic, but my girls don't care. This hangs in KD's room this year. 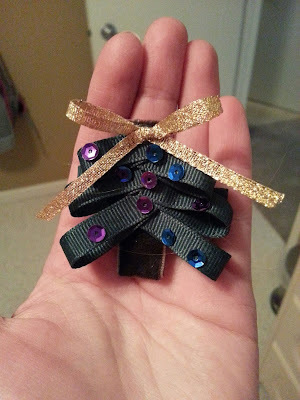 I made Christmas tree hair bows for the girls and their cousins. They are really cute. I love kid-made stuff, which we are getting a lot more of nowadays!! The girls made these button trees last year, but this year we decided to spruce them up with tree skirts and mini presents. I glue-gunned everything together and put white ribbon (barely visible against the white door, which was the idea) connecting tree and skirt for support. They look so festive now. The middle presents are flat, to which the girls said, "those are DVD's". "Or books," said I. And much as I want to swat Sandra Lee for coining the term (she's the one I heard say it anyways) "tablescape" I enjoy having company over to my house, so I did have fun putting this [*gag*] tablescape [*hack*] together for dinner. When I told my sister about it, and cursed Sandra L. for putting the term in my head, she chuckled. When she came in the house and saw it, she said, "Yup, it's a 'scape". Sure, it's not over-the top like some of those gorgeous bloggers' tables, but I was pretty proud. First, it was very pretty, but second, it had some cool touches. Each person had a stocking for their silverware, with a piece of candy inside (I could pick a meal-plan-approved kind of candy for the girls that way); I tied on a candy cane and name tag. The girls hand-wrote our guests' names onto the scrapbook-paper tags I made. 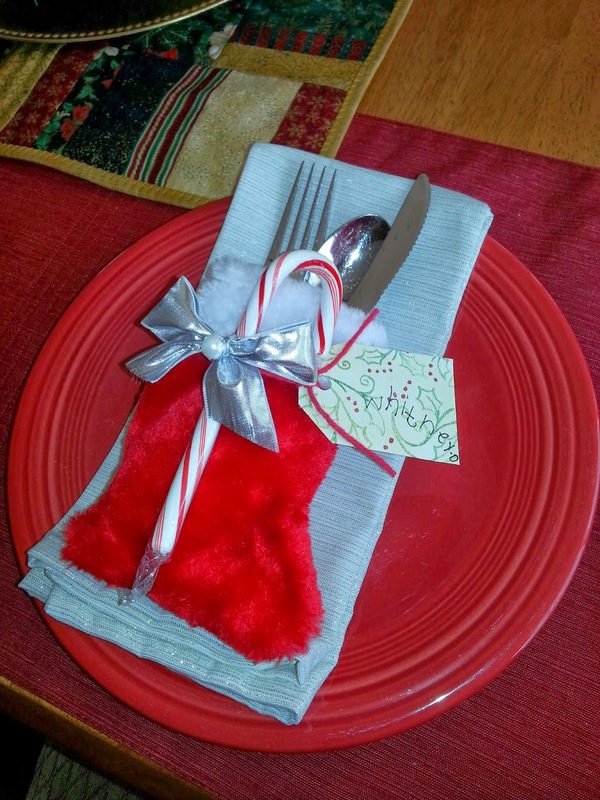 I tied on with Christmas color string and placed the stockings on Christmas fabric napkins I found at Target on 50% clearance. 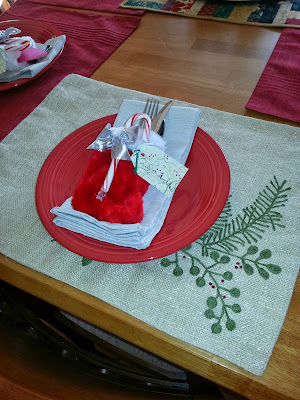 I found Shaun's and my jute-ish placemats there for 30% off, and while I eventually found more of those kind at other Target stores, I elected to get red ones for the other guests because the red ones are washable. 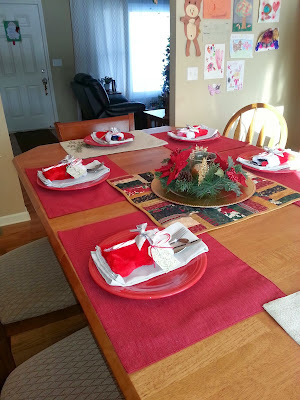 My beautiful Christmas Eve table - ready for prime rib. Oh, and the silver bows I snatched off the wedding poppers from Shaun's brother's wedding shower last weekend. I have just the thing, I thought - and I did wait for the poppers to be used before pilfering the bow. Whitney.D (even though her last name isn't Denham). So sweet. The centerpiece was from my work party last year. I snatched that, with permission, and it was perfect. 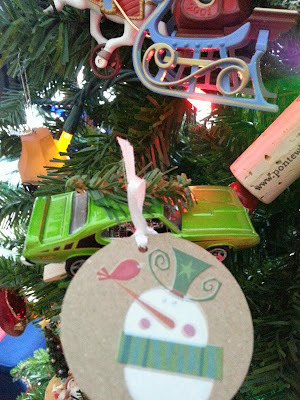 I hope your holidays were perfect and that you ring in 2014 with style! We're amping up for Shaun's brother's wedding just after the new year - very exciting!